Kagoya Review 2019: Is Kagoya a Good Hosting? Established in 1983, Japanese company Kagoya is a veteran of the internet age. It provides shared rental servers and other hosting solutions from its Kyoto data center. When it comes to web hosting, Kagoya Japan is a veteran company that was established in 1983, before the birth of the world wide web. It provides rental server solutions, dedicated servers, data center services, and cloud VPS solutions. This Japanese company’s website is in Japanese. Kagoya’s rental servers support the latest version of the PHP programming language, and the vendor discourages the use of PHP 5.6-7.0 because it does not intend to update these versions in the future. Servers come with 10 GB of free backup space, and customers can perform automatic backups at any time. You can also restore files at any time. Although the hosting solutions include free Let’s Encrypt SSL certificates, this vendor also offers advanced SSL certificates from top brands such as SureServer, GeoTrust, RapidSSL, and Secom Passport for Web. Aside from the standard plans, other hosting options include WordPress plans, VPS plans, and managed dedicated servers. With the VMware-based cloud servers, you can choose KVM and OpenVZ for higher performance and availability. Kagoya’s data center is conveniently located inland at Kyoto city, Japan, 50m above sea level to guard against damage from tsunamis or floods. Servers use ultra-high-speed SSDs that are much faster than traditional HDD storage. Kagoya’s shared rental server hosting plans are reasonably priced in Japanese yen, and there is even a free shared rental server solution. You can apply for a plan online or by post, and you can pay by credit card or bank transfer. Although a monthly billing option is available, you can get a discount by paying for 12 months hosting in advance. If you’re not sure about such a long sign-up, Kagoya offers a two-week trial period so you can try before you buy. You also get a 99.95% uptime guarantee with a compensation plan that gives back 10% of your monthly fee if the actual uptime falls short of the target. Customers can contact Kagoya via its telephone number or by filling out a contact form. Although email support is mentioned, I couldn’t determine the support email address. There is no live chat and no ticketing system as far as I can see. In case you’re wondering, this gist of the reply was that they would need more information in order to answer my question. For self-support, Kagoya provides a pretty comprehensive knowledge base. Kagoya’s I.T. services have satisfied a lot of Japanese customers since 1983, so this company must be doing something right. The only downsides for me are the limited contact methods and the typically Japanese jumbled appearance of the information on its website, although some of this might be the result of the browser translation into my native English language. 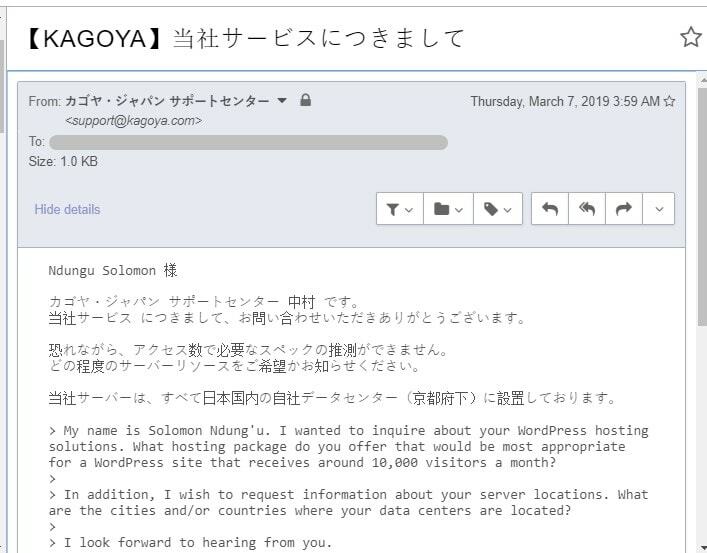 See Japanese shared rental servers and more at Kagoya. Wondering how Kagoya stacks up against other Web Hosting companies? Enter any other Web Hosting company and we will give you a side-by-side comparison.